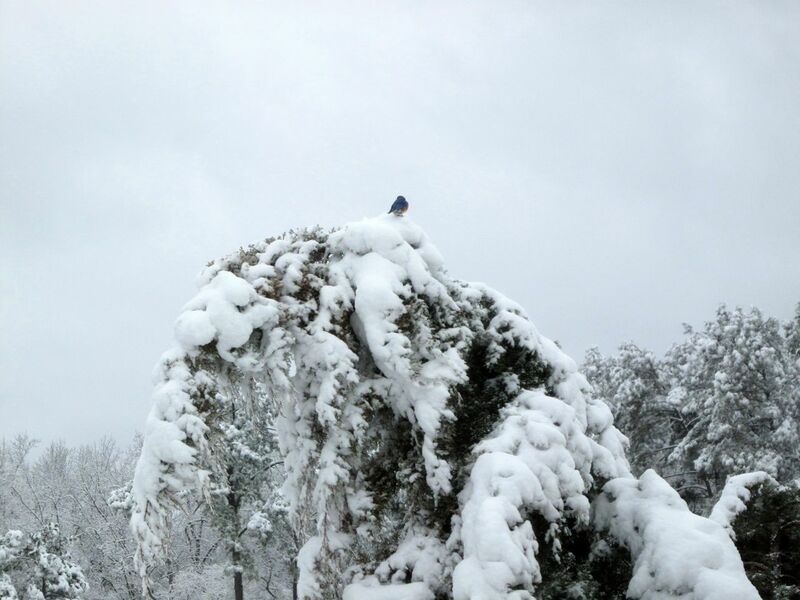 Your bluebird is a hopeful sign of spring despite the snow. Spring is on the way…soon! 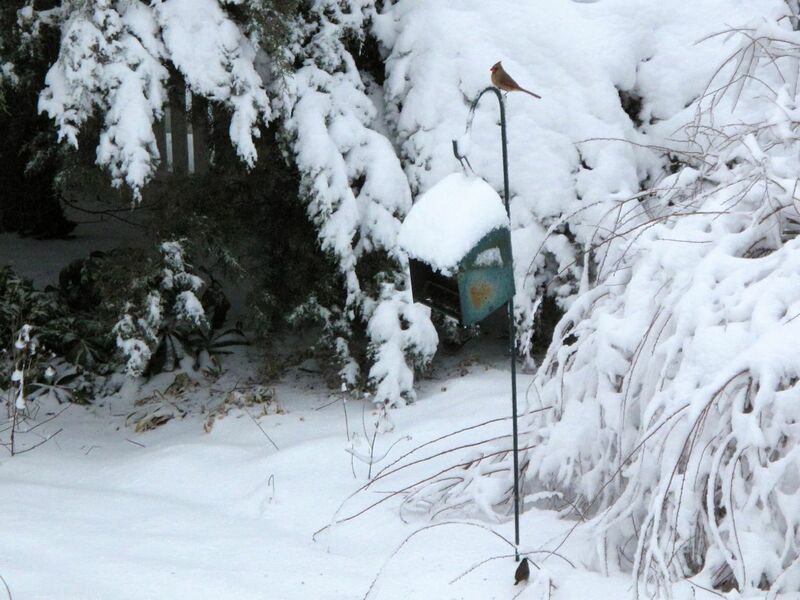 The bluebirds overwinter here. Their beautiful color stands out in the snow. The Hellebores are beautiful. So nice to have something blooming. Love the bluebirds too! Thanks Stephi. I should look for more winter blooming plants. The flowers make such a difference. I hope the Crape Myrtles bounce back. They look like they’re in such a pretty spot. We’ve just checked them out and finished removing the large, broken limb. Looks like they’ll be ok.
That’s great, I’m amazed at how resilient some of these plants can be. Sorry you got what we missed. Less than an inch and it’s all but gone. That’s the best kind of snow John. Ours is turning to slush so it may be treacherous tomorrow. The garden was already so soggy. Ouch you folks are getting hammered in the mid-Atlantic. Your poor plants and birds are not used to this….I hope the trees are OK. Glad it is melting though….no such luck here. Hi Donna, I know I can’t complain with what you and others have faced this winter. Daffodils continue to fatten up and seem to think spring is near, so I’m encouraged. Susie, your photos are very picturesque but I know you and your wildlife must have had enough by now. I watched your link, breeding Hellebores is an interesting business, it must be thrilling to discover the winners, the freckly white double near the end was particularly pretty. Glad you enjoyed the Hellebore video. I thought it was pretty informative. I visited that nursery last year for the first time. 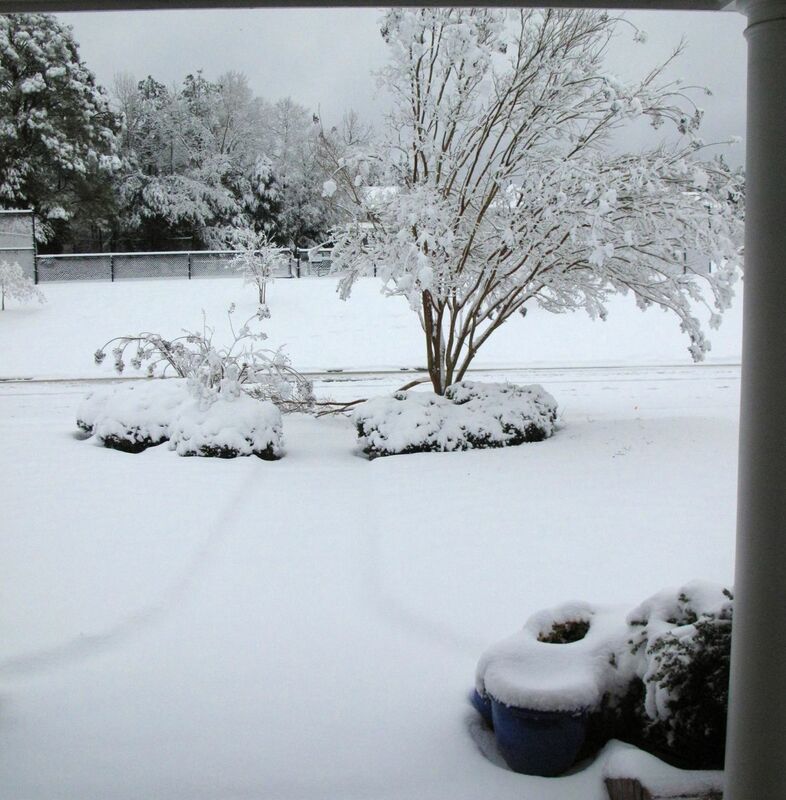 I don’t envy the storms you guys have been having….I hope the crepe myrtles will be ok! Thanks Matt. We trimmed the broken branch away and will hope the crape myrtle is not wakened by the stress. The smaller popped back up after the snow melted so it should be ok too. Your garden has been transformed into a Narnia like image Susie – it makes me shiver just looking at your snowy pictures! The birds seem to be making the most of your treats and I certainly hope spring arrives soon for you. The neighborhood kids have certainly enjoyed the snow today. I’ve never seen so many snowmen. The little girl next door is working on her third one. It looks like a winter wonderland there. Here we mostly just got rain and a dusting of sleet. I don’t know whether to be disappointed or relieved. It was lovely but it sounds like you came out with the better deal today (unless you truly are a snow person!). Stay safe. It looks so pretty, but the danger of broken branches can dampen the enthusisam! We had similar snow in January but the problem was that it froze and hung around for about a week. 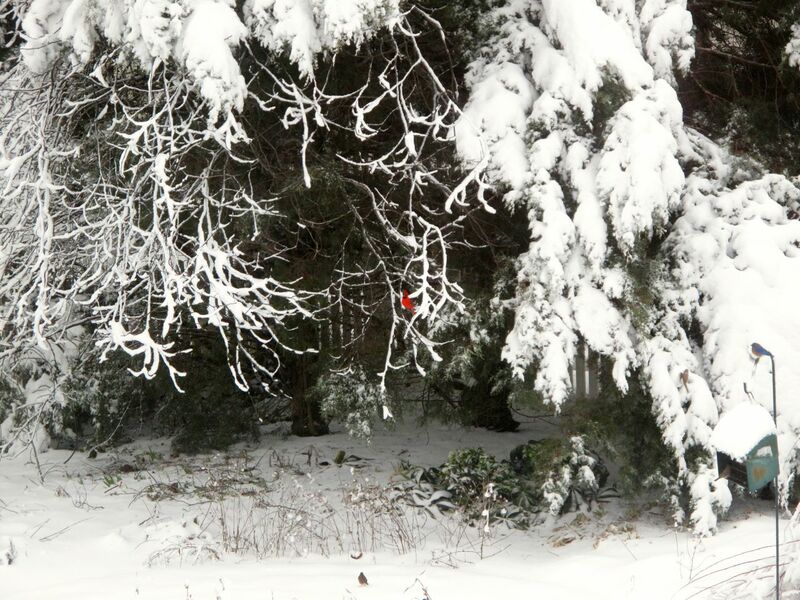 Many branches just couldn’t stand the burden… I hope it melts rapidly for you and your birds! Yes, this kind of snow is deceptively pretty. Hope you didn’t lose too many branches Cathy. It can weaken the trees although I must say, many seem quite resilient to this kind of damage. We were actually very lucky here. There were many big trees down, many people were without power and there were lots of accidents. In contrast we didn’t even lose our internet connection! 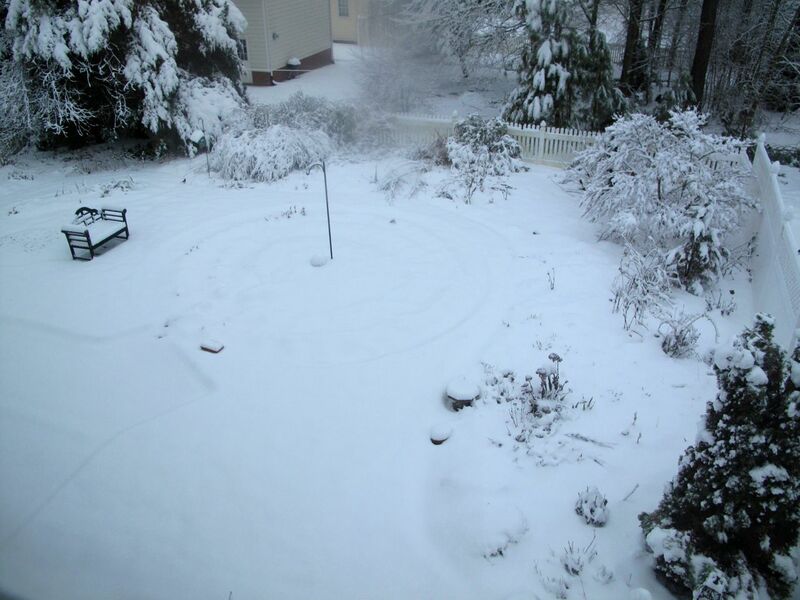 Such beautiful photos of your garden transformed by snow, the birds certainly stand out against all the white. Your hellibore is lovely, I hope you have more flowers when your snow decides to go. Stay warm and safe. Thanks Pauline. 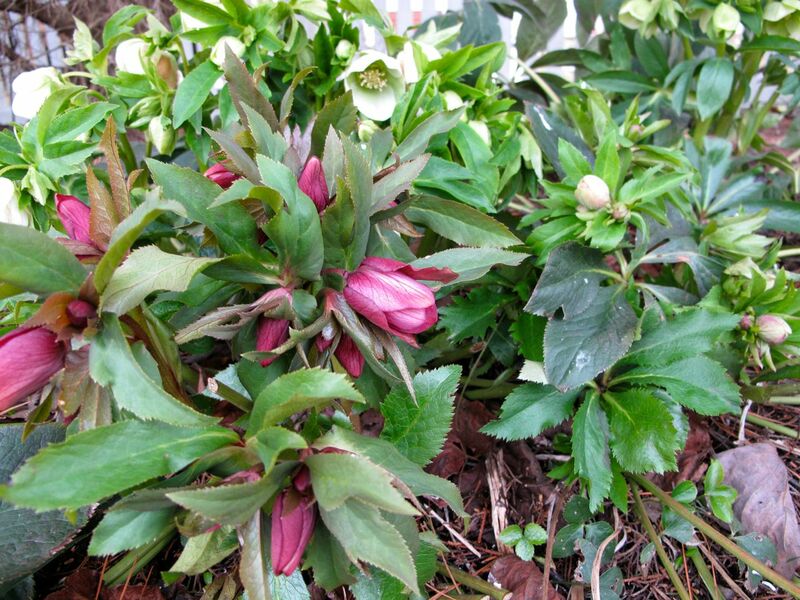 I nearly stepped into one section of hellebores that were covered with snow yesterday while outside trying to remove snow from the gardenia branches. I hope they don’t mind this little pause in their bloom schedule. I don’t remember ever seeing quite so much snow in your garden Susie. It looks really beautiful but it isn’t good if branches are breaking under the pressure. 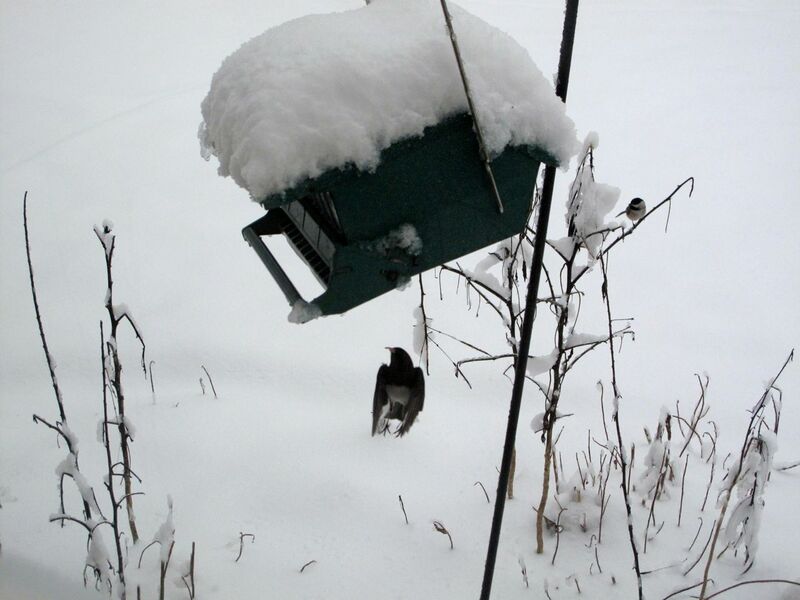 Hopefully it will melt quickly for you and the birds. We’ve had more snow than this but not in many years, probably pre-blogging days. Fortunately most snow has melted from the treetops. There is still a lot on the ground through and it may take it a while to clear. I see daffodils fattening up so they’re poised to move ahead when we get a few warm days. Sorry to see you have some damage. We had about 2 inches of heavy, wet snow, but thankfully it was much less than predicted. Let’s keep our fingers crossed this is the last one! Marian, I’m with you–hoping this is the last one. It has been a surprise to have so many winter storms. Hope you didn’t have any damage from the snow. The little girl next door is rarely outside but she built 3 snowmen yesterday and played in her yard all day! Crape myrtle grows in every God forsaken lot yet your well cared or trees just don’t seem to get a break! Glad the damage isn’t too bad, but sorry they can’t just go along on their way. The snow looks beautiful but I don’t blame you for being done with it. I had to laugh. You are so right about crape myrtles. They’re ubiquitous around here. Just in the neighborhood, even the folks who perform “crape murder” each spring seem to have more robust trees. Wow you really have a winter taste in there! In this time of the year I start feeling a bit sick of winter though. Fortunately it felt like spring here the past weekend (today it’s rainy though). I love your hellebores and I’m amazed of the birds that visit your garden! I’m glad it’s starting to feel like spring where you are Alberto. We’ve still snow on the ground (very unusual for it to last so long), and a rainy week is forecast. The birds have been a treat to watch this winter.